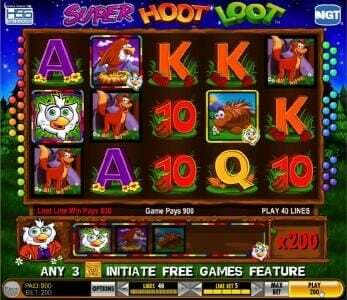 Super Hoot Loot Slots has not been reviewed yet, be the first to rate this slot. 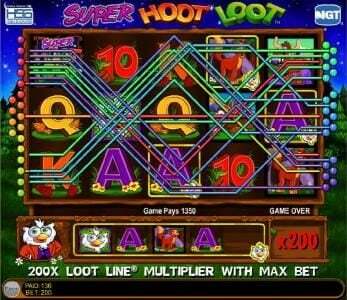 Super Hoot Loot Slot has 5 reels and 40 paylines. 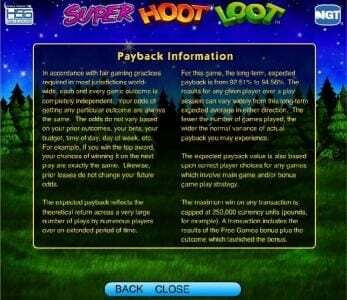 This is a game that was designed by IGT, and they’ve included in it a jackpot of up to $20,000, plus free spins, multipliers, scatters and wild symbols. 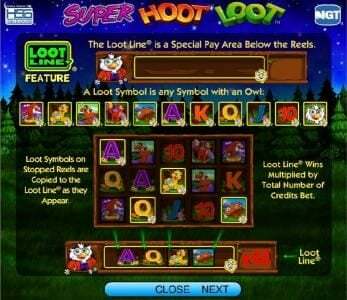 A slot that has a focus on wild life, with a bit more attention for the owls, Super Hoot Loot has the forest and the night sky as its background, and a cartoonish design that fits well with the theme. There are two different wild symbols in it, including the game logo and the owl (a wild multiplier), plus a yellow safe which is used as a scatter. Regular symbols are half forest animals, half playing cards. The playing cards are from 10 to Ace, each with some grass behind it. The forest dwellers are the porcupine, fox, moose, bear and the eagle. A total of 40 paylines, with 5 coins per payline, result in a maximum bet of 200 coins, or $200. The player decides how many coins he wants to wager. The game’s jackpot, of 20,000 coins, means $20,000 cash. 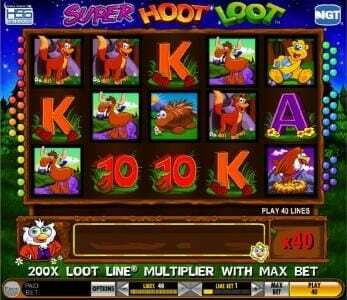 The main symbol of the game, the owl, acts as a wild symbol that also multiplies prizes. That means that whenever this symbol is part of a winning combination, it will also multiply the prize value by 2. The next wild symbol, the one with the game logo, will do the same things as the owl, but it will not offer a multiplier for the prizes that it contributes to. One interesting feature of the game is the loot line, which is an area placed beneath the reels, where 5 symbols can accumulate. Symbols that have a small owl head in the corner will accumulate in that area. A scatter symbol, which uses a safe as its image, will make appearances on the first, the third and the fifth reels. With three of these symbols, the player gains access to a round with free spins. 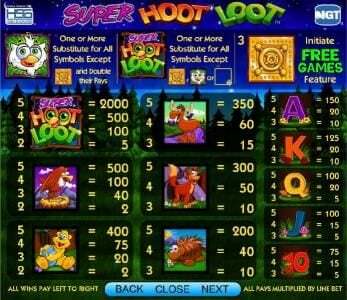 When the player uses those free spins, the safe symbol is green instead of yellow, and if three green safes are available, there is a prize, which is 10x the initial bet. 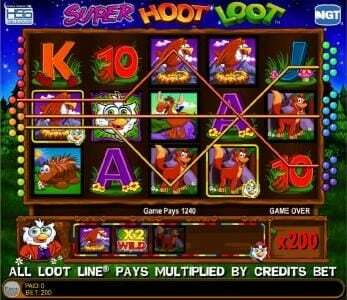 As for the Free Spins, the player receives 7 of them, plus there is a wild multiplier symbol added to the loot line during each Free Spin. 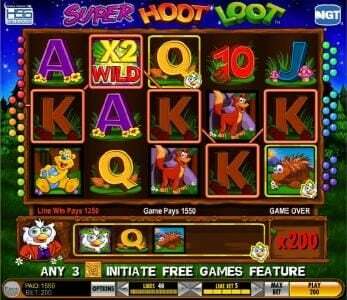 It’s a cute slot, with some good features in it, so there is no reason to avoid it if you enjoy its nature theme.